"RIP Tina sweet lady .Much love to your family . Angela"
Christina "Tina" V. Gilbert, a cherished wife, mother, aunt, grandmother and great grandmother, passed away peacefully on November 16, 2018 in Colorado Springs, Colorado. 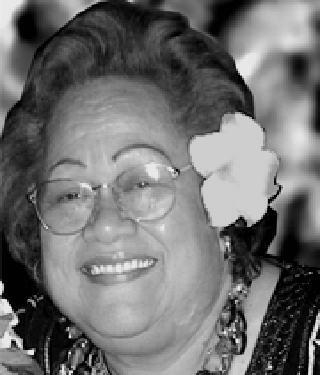 She was born in Fagatogo, American Samoa, October 28, 1940, the baby of eleven children born to the late Vitolio and Maila Visesio. She has been a resident of Monterey, California for over 40 years before moving to Colorado Springs in 1995. Family and close friends were an important part of her life. She enjoyed life to the fullest and did everything with her family. Her favorite past time was going to the local bingo, where everyone knew her as the "Lady with the Flower in her Hair". She was married to Milton Gilbert Jr. (deceased). Her devoted Children, Maria (Falaniko) Samate of Colorado Spring, Colorado; Agnes (Miguel) Hernandez of Colorado Springs, Colorado; Juliann (Edward) Asi (deceased) of Texas; Maila Gilbert of Colorado Springs, Colorado and Arnold Gilbert (deceased); cherished grandchildren Destynie (Patrick) Lauti, Travis (Monica) Samate, Katryna (Keve) Samate-Min, Royce Asi, Raylyn Gilbert, Jericho Asi, and Victor Gilbert: treasured great grandchildren, Emanuel, Jayden, Jianina, Neriya, Tavita, Analeigh, Verity, Tytus, Xilas, and Matai: as well as an array of sensational nieces, nephews and friends. Final Viewing will take place Friday November 30, 2018 at Noon with Funeral Service to follow at 1:30pm at KingdomRock Church. Burial Memorial will proceed to the Pikes Peak National Cemetery. A Reception Dinner will immediately follow at KingdomRock Church.